Just some of the painted sherrins that will be up for auction. Sydney Swans legends and GO Foundation founders Adam Goodes and Mick O’Loughlin are raising the profile of Indigenous artists with an online auction of hand painted Sherrins. 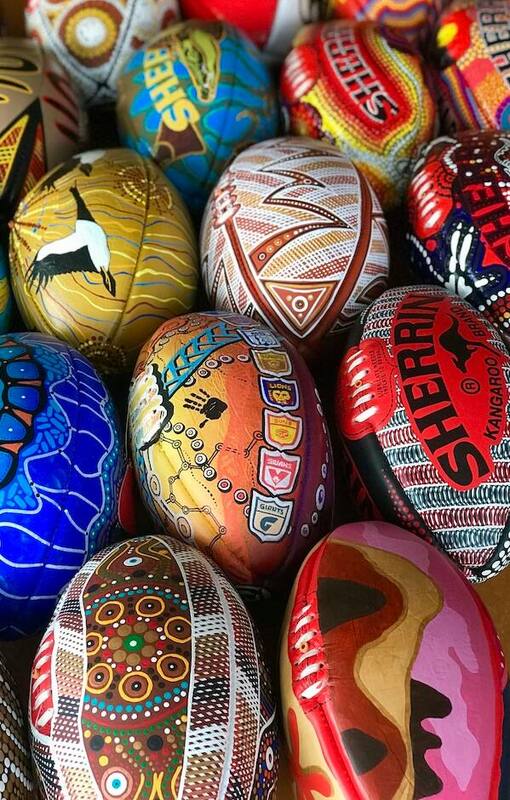 The GO Foundation asked 24 artists from NSW, Queensland, South Australia, Northern Territory and the Tiwi Islands to create their own original Sherrin artworks, and the results are spectacular. They tell stories of Country, Community and coming together across Australia to celebrate and play the great game of AFL. The artists have donated their works to the GO Foundation. Any money raised from the sale of the balls will go towards providing GO public school scholarships for Indigenous kids from kindy to tertiary studies.